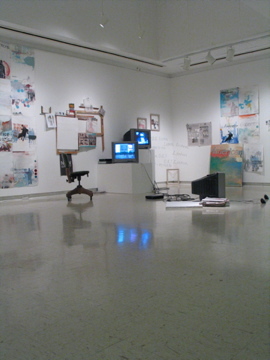 Here are a few preview photos of my Thesis exhibition “Words Are Not Enough” at the Inova Gallery on the UW-Milwaukee Campus. Our mediated world is an ever-shifting collage of competing voices, ideologies, and commercial interests that vie for attention in the larger social discourse. This fact is undisputable, but the overarching ideological construct of the mass media that these voices operate within is both exceedingly narrow and at the same time open to many possible interpretations. As an artist, one of my main points of investigation is the nature of the dialectical image, and how the strategy of collage creates or obscures meaning through the unification of heterogeneous materials in a work of art. The dialectical image is an image that brings together distinct worlds simultaneously to reveal a hidden truth. The construction of meaning in the text of the media is a site of cultural struggle. 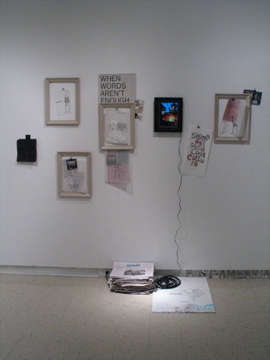 This installation examines the text of the media by using mediated source material with a particular eye toward the language of overburdened signifiers and specifically loaded images and phrases. 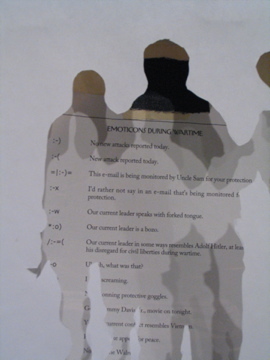 I have explored the notion of the dialectical image through a reworking of the text drawn from the mass media. By text, I do not mean solely the written word within these forms of mass communication, but also the meta-text of the larger ideological framework of the media as a cultural institution. 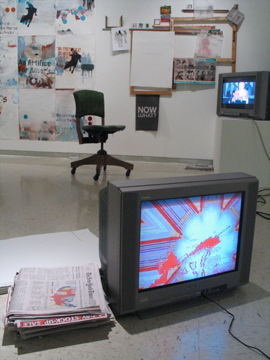 Dialectically juxtaposing and reworking images, phrases, and video from our contemporary period and the historic cultural shift occurring in our country makes this notion of media as a site of cultural struggle all the more clear, while ultimately reinforcing the underlying ideology of our era. The act of appropriation from mediated sources begs the question of who owns the products of our mediated culture, and who controls the meanings they convey. The juxtaposition of these appropriated materials encourages a critical examination of the language of our mediated culture.